I recently gave my new business card to a potential client. 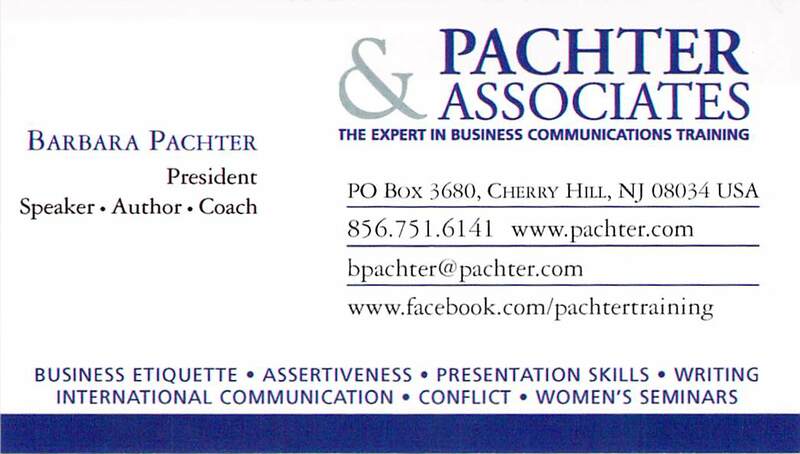 She was impressed that my Facebook address (www.facebook.com/pachtertraining) was on my card, as she had seen few cards that provided that information. You can see the card at the end of the blog. Business cards tell people what you do and provide a way for them to contact you. Because social media has changed the way we connect with our customers, clients, colleagues and employers, your card may need to include additional information – such as your addresses for Facebook, LinkedIn, Twitter, or your blog. You will have to decide how much to include, and how to do so without overloading your card. 1. Have I included the necessary information? Think about the majority of your potential clients and customers, and include on the card the information they will need. This usually means your name, your title, company name/logo, address, phone number, and email and web addresses. 4. Should I include a quick response (QR) code? These are bar codes that can be scanned by Smartphones to provide a link to your websites or LinkedIn profile. This suggestion was discussed in an article for job seekers on CareerBuilder.com. If you include a QR code, place it on the back of the card. 5. Is a photograph necessary? Most corporate cards do not include photographs, but you may want to include a photograph if you use your card for marketing purposes. Speakers will often have photographs of themselves on their cards. Information on giving out your cards can be found in my book When The Little Things Count…And They Always Count. This post was really helpful. I never thought about using the back of the card for social media! Nice blog..!! in business world without business cards feels awkward...so its great info to promote new things.. Plastic card innovative abilities usually are in-house this is sometimes a quite valuable approach to take. These kind of malicious problems can certainly many be made it simply by plastic greeting cards. Throwing the item within a glass regarding dark caffeine will be alright simply because after buying the item outside the mug, plastic business cards the words on the minute card remain readable. Business identification is most important for every business, therefore business owners are preparing business cards, business address, business social platforms and business brand recognition. So that, customers and client can easily recognize business value. Social platforms are now the highlighting part of every business and it helps to promote the business concept also.